A tiny tuner that delivers in spades. for its units' instant response and extreme accuracy, featuring an LED ring driven directly by the guitar signal and electronically strobed. 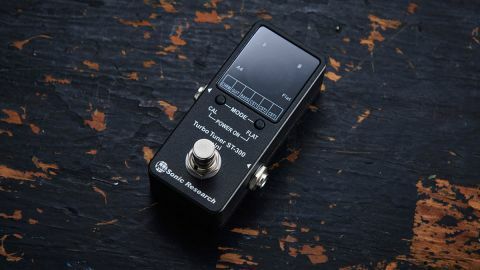 The ST-300 Mini tuner puts that technology, with a stated accuracy of 0.02 cents, in a pedal the size of TC's popular PolyTune 2 Mini. Of the six modes, chromatic mode displays the pitch of the plucked string, but there are also guitar and bass modes with a string number instead. Both of these and the remaining three are custom modes, so you can program and store altered tunings. For drop tunings, a facility lets you lower the pitch of all notes below the regular tuning from one to six semitones, but there's no pitched-up capo tuning facility. The display of red LEDs circle faster the more out of tune the note is, but remain still when the correct pitch is reached. Note detection is fast and the display is intuitive, but it's a matter of personal taste whether you prefer spinning LEDs or getting a stable green light as found on other tuners. If you're after a tiny tuner for your 'board, but don't need that polyphonic capability to show you which string is out of tune at a glance, and you also use altered tunings, then this may be the one for you.